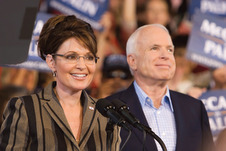 Photo above: Sarah Palin with Republican presidential nominee John McCain. 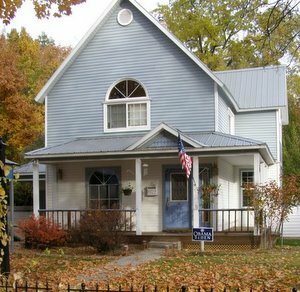 Photo below: Sarah Palin's first home at 712 N. Fourth St. in Sandpoint. SANDPOINT, ID-In February 1964, Beatlemania was invading America. Sandpoint Motors was cleaning up after a fire. Three babies were born at Bonner General Hospital in less than a week. Their parents all taught at Sandpoint Junior High School (SJHS). Four days later, Bill and Andrea Parenteau welcomed their fourth child, Joseph. Drinkwater noted that the Parenteaus were proud of their baby. On Feb. 11, a fire broke out at Sandpoint Motors. Friends recall that Chuck Heath, living just a few blocks away at 712 N. Fourth, went to watch Jack Parker move the cars. Later, he was summoned home by his wife, Sally, who was going into labor with the third of their four children. That evening at 6 p.m., Dr. Helen Peterson, Sandpoint’s first female general practitioner/surgeon, delivered a 7-pound, 11-ounce baby girl. Though her legal name would be “Sarah Louise,” a light-hearted Chuck Heath told Drinkwater that he’d call her “Oscar” and raise her as a tomboy. The Heaths later moved to Alaska. Sarah Louise graduated from Wasilla High School in 1982 and then returned to Idaho for college, first attending North Idaho College and then the University of Idaho, graduating in 1987 with a journalism degree. She returned to Alaska to start her life as a wife, mother, broadcast journalist and, later, a Republican politician rising to the state’s highest office – governor – in 2006. The Albertsons stayed in Sandpoint. Don and Tom even taught together at Sandpoint High School. Most of the Parenteau family lives in southern Idaho. Joe works as an information technologist in Boise. Sarah-mania came “south from Alaska,” invading the Lower 48 and the world the moment Republican presidential nominee Sen. John McCain introduced his running mate to scores of Republican delegates and millions of TV viewers in August. Like the Sandpoint doctor who delivered her, 44-year-old Sarah (Heath) Palin has broken through barriers as the youngest and first female governor of Alaska and as America’s female Republican vice presidential nominee. Palin has sealed her place in history, no matter the outcome of the 2008 presidential election. Like the Beatles, her name rose from relative obscurity to worldwide recognition. Virtually overnight, the mother of five, who can shoot a moose and field dress it, too, transformed into a cult figure – inspiring Sarah dolls, Sarah glasses and Sarah hairstyles and even quickly penned Sarah books. McCain’s VP announcement resonated instantly in Sandpoint where locals proudly recounted their connections with the governor and her family. “I was in the eighth grade. I held her. I remember a ton of black hair; the others (siblings) were blondies,” says Susie Puckett, one of Chuck Heath’s science students and babysitter to Sarah. Susie recalls feeling devastated when “Mr. Heath,” the teacher who turned her on to science, and his family left for Alaska that summer. Though Sarah lived for just three months in Sandpoint, her father’s roots run deep because of his Sandpoint High School athletic achievements, coaching, teaching and, according to friends, even a few pranks. After moving to Hope with his parents, Charlie and Marie Heath, Chuck began to distinguish himself early as a gifted athlete. Don Albertson knew Chuck as a worthy opponent in Thursday-night county league basketball games, organized by Coach Cotton Barlow. “We also played on the same (high school) football team and competed in track,” Albertson adds. “(He participated) in anything fast in track. He held the SHS 100-yard dash record until Caleb Bowman broke it in the ’90s.” Heath also led the Bulldog football team his senior year, with 12 touchdown receptions, including the winning catch to beat Lewiston for the first time. He continued his athletic career at Columbia Basin Junior College, where he met Sally, a Richland native. After graduating from Eastern Washington State College, he taught three years in Sandpoint, followed by 30 years in Alaska. In 2004, Chuck was inducted into the SHS Athletics Hall of Fame. By 2004, while daughter Sarah was becoming a rising star in Alaska political circles, Chuck had retired from teaching and was employed as a government trapper and wildlife specialist. He even spent time trapping rats in New York after the 2001 World Trade Center attack. He also worked as a commercial fisherman, gold miner and big game outfitter. His SHS Hall of Fame biography states that three athletes he coached from 1963 – Larry Jacobson, Brian Timblin and Adrian Lane – had also moved to Alaska, becoming his hunting and fishing buddies. Lane is married to Marilyn Gray, daughter of former Sandpoint Mayor Floyd Gray. The Lanes, living in Alaska since 1984, have watched the Heath children grow up. Their children have babysat Sarah’s. Marilyn and her sister Loralee Gray have also spent time at the governor’s mansion. In a recent Idaho Statesman article, Gray, now of Boise, described her “fly-on-the-wall” status last March. She created and installed a huge, birch wood map of Alaska in the governor’s office, while Palin conducted business. Idaho State Rep. George Eskridge of Dover met Palin at the Pacific Northwest Economic Region forum in January. PNWER includes representatives from the Pacific Northwest and Canadian provinces. “I was impressed with her sense of direction, where she wanted to go,” Eskridge says, “and that she had a strong sense of resolve as governor of her state. Whether or not Chuck Heath has to wear another suit for an inaugural ball, the outcome will be OK.